College of Law students Ibrahim Lawton L’17 and Khadijah Peek L’16, representing the plaintiffs, won the 38th Annual Lionel O. Grossman Trial Competition. Representing the defendants were finalists John Boyd II L ’16 and Steven M. Nelson L ’16. John F. Boyd II, Steven M. Nelson, Khadijah N. Peek and Ibrahim K. Lawton, from left, participate in the Grossman Competition. Judge Glenn T. Suddaby L’85, United State District Judge for the Northern District of New York, presided at the Oct. 26 event. The jury consisted of Frank H. Armani L’56; Hon. Mary Anne Doherty, Syracuse City Court Judge; Travis H.D. Lewin, College of Law Professor Emeritus; Hon. Robert D. Mariani L’76, United States District Judge for the Middle District of Pennsylvania; Hon. David E. Peebles L’75, United States Magistrate Judge for the Northern District of New York; and Hon. Frederick J. Scullin Jr. ’64, Senior United States District Judge for the Northern District of New York. 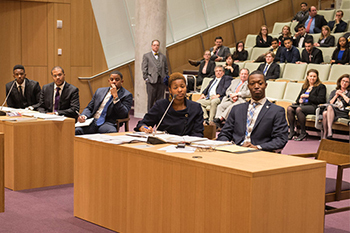 The competition, held by the College of Law Moot Court Honor Society, involves both second- and third-year College of Law students and is designed to hone and test their skills in evidence, courtroom etiquette and knowledge of trial practice. Forty-eight students participated in the Trial Competition. This year’s trial problem set focused on a civil case. The scenario revolved around a negligent homicide claim when a fictitious police officer shot what he thought was an armed individual. The finalist teams participated in a full trial. Lawton also won the esteemed Frank H. Armani L’56 Advocacy Award as the best advocate. Armani stands as a role model for legal ethics and is widely regarded as a hero within the legal profession. In 1973, he made an immeasurable personal sacrifice during his representation of Robert Garrow, the defendant in the Lake Pleasant Murder case in Lake Pleasant, N.Y. He has received numerous awards, including a distinguished-lawyer award from the Onondaga County Bar Association in 2006 and, more recently, a nomination for the Michael Franck Award presented by the ABA Center for Professional Responsibility. The competition’s namesake, Lionel O. Grossman L’16 passed away in October 1991. At that time, he was one of the College of Law’s oldest living alumni. His professional achievements, community service and commitment to excellence personified the ideals of the legal profession. For more than 30 years, Grossman devoted himself to the fight against cerebral palsy. In 1946, he founded the Cerebral Palsy Center and became the president of the United Cerebral Palsy Association of Syracuse and New York State. He also served as co-counsel to the National Cerebral Palsy Legislative Committee. Grossman’s contributions to the community were not limited to a single cause. He was a former director of the Syracuse Symphony Orchestra, a Syracuse Boy Scout Commissioner, director of the YYHA and the Jewish Community Center, director of the Jewish Welfare Federation and leader of the local Israel Bond Drive and active in Temple Adath Yeshurun. In recognition of his exemplary service, Grossman received numerous awards during his lifetime, including the Chancellor’s Medal in 1978, the first Syracuse Distinguished Service Key and the Syracuse Rotary Club’s 1954 Outstanding Citizen Award.